Many people who have toddlers that make a mess might think baby wipes are the best thing since sliced bread. They certainly are a convenient way to clean up a mess or to clean hands quickly. A more environmental way to use disinfecting wipes is to make your own out of cloth that can be washed and reused again and again. Most of the ingredients that are used to make homemade disinfecting wipes can often be found at variety of local health stores in your area. If you do not have any around your area, then you may want to search online to obtain the ingredients you need to make your own disinfecting wipes. One item you will need to find is a suitable plastic container to use for your wipes. Any plastic (or glass) container with a lid can be used for this project. This includes a small plastic tub to using a plastic container in your kitchen used for cookies. You should first make sure to wash it out first before being used as a container for your disinfecting wipes. 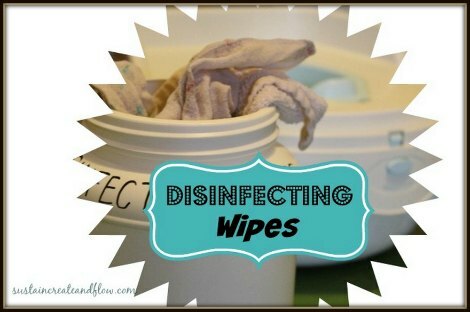 Any scraps of cloth can be used for your disinfecting wipes. This includes scraps cut from any t-shirt to left over paper towels. The type of cloth or material to use will depend on what you have available and your personal preference.